Included in this document are the following Terms & Conditions. Please review these carefully. Entry is only open to residents of Australia and New Zealand, who purchase a subscription to Breathe Magazine Australia during the entire Promotional Period. Entrants under the age of 18 years must have prior parental or legal guardian consent to enter. Employees (and immediate families) of Lovatts Media and agencies associated with this Promotion are ineligible to enter. The Promotion commences on 20 December 2016 and closes midnight (AEST) on Wednesday 5 April 2017. The winner will be chosen at 10:00 AM (AEST) on Friday 7 April 2017 at Lovatts Media offices, 221 Mann St, Gosford, NSW 2250. The Promoter's decision is final and no correspondence will be entered into. To enter individuals must, during the Promotional Period, purchase a 1-year print subscription or a 2-year print subscription to Breathe Magazine Australia. Digital only subscriptions will not be valid for entry into the promotion. A valid entry is subject to verification of the credit card or, if payment is made by cheque, the cheque must be cleared for payment by the close date of the promotion. To be eligible, participants will be required to provide their name, address, postcode, telephone number, and email address. Entrants who respond to a personal invitation to subscribe may also be eligible to receive double the standard number of entries for their subscription. The winners will be determined by draw. The first 5 valid entries selected for the competition will win an all-day Endota Spa Package valued at $550 which can be used at any participating Endota Spa location. Total prize pool is valued at $2,750. Choice of date is dependent on Endota Spa availability. The prize does not include flights, transfers or transport to the Endota Spa location. Any winner residing in New Zealand or the Northern Territory will receive an equivalent spa experience in their home state. The Promoter (Lovatts Media) reserves the right, at any time, to verify the validity of entries and to disqualify any entrant who submits an entry that tampers with the entry process or is not in accordance with these Terms and Conditions. Failure by the Promoter to enforce any of its rights at any stage does not constitute a waiver of those rights. The winners will be notified initially, if possible, by phone or email, within 48 hours of judging and the winners’ details will be published on www.breathemagazine.com.au. A written confirmation will be sent to the winners at the registered subscription billing address. The name of the winners may be published and the winners shall participate in any publicity activities regarding the Competition if requested by the Promoter. The Promoter and any companies associated with this competition accept no responsibility for any loss or damage whatsoever which is suffered (including but not limited to indirect or consequential loss) or for any personal injury suffered or sustained as a consequence of the prize except for any liability which cannot be excluded by law. Unless expressly stated within these Conditions, all expenses incurred in relation to the prize (including tax implications) are the responsibility of the winners. Prize values are correct at time of printing/submission; no responsibility is accepted for any variation in the value of any prizes. In the event that for any reason whatsoever a winner does not take the prize at the time stipulated by the Promoter, then the winner will forfeit the prize and cash will not be awarded in lieu of the prize. In the event of any unclaimed prizes a second judging will be held 3 months after the original prize draw at the same time and place as the original draw and a winner/s chosen. The winner/s from this judging will be notified in the same manner as set out in clause 6 of these Terms and Conditions. Any cost associated with accessing the promotional website is the responsibility of entrants and is dependent on the Internet Service Provider used. Nothing in these Terms and Conditions limits, excludes or modifies or purports to limit, exclude or modify the statutory consumer guarantees as provided under the Competition and Consumer Act, as well as any other implied warranties under the ASIC Act or similar consumer protection laws in the States and Territories of Australia and New Zealand ("Non-Excludable Guarantees"). Except for any liability that cannot by law be excluded, including the Non-Excludable Guarantees, the Promoter (including its respective officers, employees and agents) excludes all liability (including negligence), for any personal injury; or any loss or damage (including loss of opportunity); whether direct, indirect, special or consequential, arising in any way out of the Promotion. As per the provisions of the New Zealand Privacy Act, all personal details of New Zealand entrants will be stored at the office of the Promoter. A request to access, update and correct any information should be directed to that office. The Promoter is: Lovatts Media, Level 4, 221 Mann St, Gosford, NSW 2250 Australia. ABN 99 003 314 681. Authorised under Permit Number NSW LTPS/16/1023. 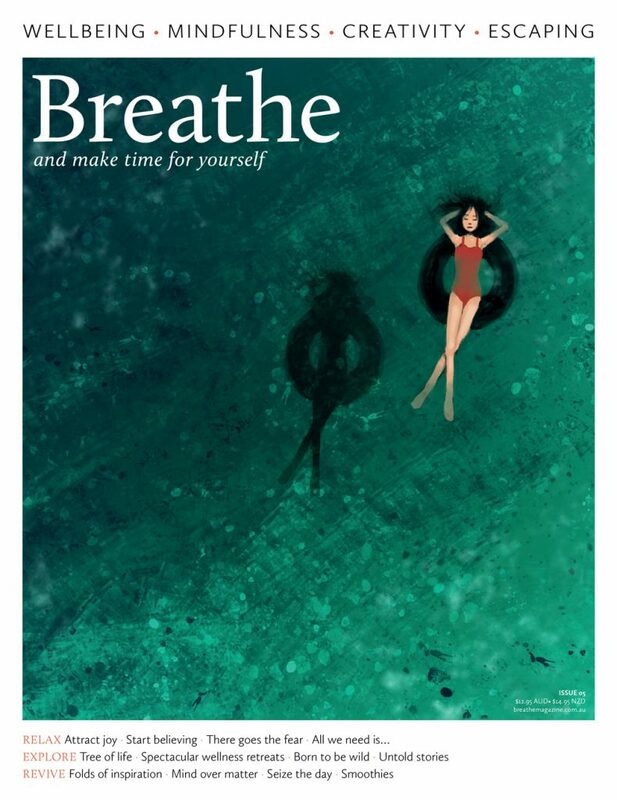 Breathe is a bi-monthly publication. Please allow between 8 - 12 weeks for your first delivery. Once your subscription commences, deliveries can be expected every 2 months. The delivery date of the first magazine is determined by the date on which you order and the date on which the next available issue is printed. This may be up to 12 weeks before the scheduled on sale date. If you are a subscriber and you change your address or any other relevant details you must notify Lovatts Media. Lovatts Media is not liable for any consequences of your failure to do so, including but not limited to subscription issues being sent to an incorrect address. Lovatts Media is not obliged to re-send returned mail or undelivered mail due to the subscriber’s failure to provide the correct address details. In the event of a change in circumstances (ie a deceased subscriber) the balance or remainder of the subscription may be transferred to another party. Lovatts Media will only refund the balance remaining on your subscription where a product is not as described or is faulty. Lovatts Media is not required to provide a refund for change of mind. Issues already delivered or already dispatched will be deducted from the total at their full cover price. In the case of a gift, the balance will be refunded to the original purchaser. If the credit card used to make the original payment is no longer valid, for example if it has expired, a cheque payment will be issued. Cheques may take up to four weeks to be processed. i) If you purchase a subscription from a third party provider and choose to cancel before receiving the first issue,you are subject to the refund policy of that provider and need to contact them directly. Lovatts Media cannot assist in processing a refund before we have received a Subscriber's payment and account details from our third party providers. ii) If you have purchased a subscription from a third party provider and wish to cancel after receiving the first issue, Lovatts Media will consider a refund under the circumstances outlined in 5a) above. However, please note that there will be additional third-party fees and charges deducted from any refund payable. Welcome to breathemagazine.com.au, provided by Lovatts Media Group (ABN 99 003 314 681). The following terms and conditions (Terms of Service) govern your use of the websites, content, software and services offered through breathemagazine.com.au. We may change the Terms of Service at any time. You can review the most current version of the Terms of Service by clicking on the Terms of Service link located at the bottom of our web pages. You are responsible for checking these terms periodically for changes. If you continue to use breathemagazine.com.au after we post changes to these Terms of Service, you are signifying your acceptance of the new terms. We may discontinue or change any product, service, feature or specification on breathemagazine.com.au at any time and without notice. We offer premium products, services and subscriptions for a fee. Payment and other applicable terms relating to your use of the products and services, if any, will be disclosed to you at the time you sign up for any fee-based products or services and you will be subject to those additional terms. Any order placed by you is an offer by you to purchase the particular product or service specified. We reserve the right to accept or reject your order for any reason, including, and without limitation, an error in your order or in the material or content on the breathemagazine.com.au website, or the unavailability of the product or service. attempts to gain unauthorised access to any services, user accounts, computer systems or networks, through hacking, password mining or any other means. We may take any legal and technical remedies to prevent the violation of this provision and to enforce the Terms of Service. Material on this website including but not limited to the selection, organisation, arrangement, and enhancement of the content, the look and feel of the colour combinations, button shapes, and other graphical elements, logos, brands and trade names is protected by all applicable laws including copyright and trade mark laws and may not be used without our prior written consent. Any unauthorised use of such material may violate copyright laws, trade mark laws and privacy laws and civil and criminal statutes. You may not use any data mining, robots, or similar data gathering and extraction tools on the content, frame any portion of breathemagazine.com.au or content, or reproduce, reprint, copy, store, publicly display, broadcast, transmit, modify, translate, port, publish, sublicense, assign, transfer, sell, loan, or otherwise distribute the content without our prior written consent. You may not circumvent any mechanisms included in the content or used by us to prevent the unauthorised reproduction or distribution of the content. breathemagazine.com.au may include links to third party websites, including links provided as automated search results. Some of these sites may contain materials that are objectionable, unlawful, or inaccurate. These links do not mean that we endorse these third party sites or services. You acknowledge and agree that we are not responsible or liable for any content or other materials on these third party sites. Any dealings that you have with advertisers found on breathemagazine.com.au are between you and the advertiser and you acknowledge and agree that we are not liable for any loss or claim you may have against an advertiser. Your use of breathemagazine.com.au is at your own risk. We make no warranties, representations or guarantees about breathemagazine.com.au and to the fullest extent permitted by law, we and our suppliers specifically disclaim implied warranties that breathemagazine.com.au and all software, content and services distributed through breathemagazine.com.au are merchantable, of satisfactory quality, accurate, timely, fit for a particular purpose or need, or non-infringing. We do not guarantee that breathemagazine.com.au content will meet your requirements, is error-free, reliable, without interruption or available at all times. We do not guarantee that the results that may be obtained from the use of breathemagazine.com.au, including any support services, will be effective, reliable, accurate or meet your requirements. We do not guarantee that you will be able to access or use breathemagazine.com.au (either directly or through third-party networks) at times or locations of your choosing. No oral or written information or advice given by a us or our representatives shall create a warranty. You may have additional consumer rights under your local laws that this contract cannot change. We assume no responsibility and shall not be liable for any damages or viruses that may infect your computer equipment or other property on account of your access to and use of breathemagazine.com.au. We assume no responsibility and shall not be liable for any problems or technical malfunction of any telephone or network or lines, servers or providers, technical problems or traffic congestion on a mobile network, or any combination thereof, or any other technical failures related to or resulting from your access to and use of breathemagazine.com.au. Your sole and exclusive remedy for any dispute with us is to discontinue your use of breathemagazine.com.au. We and our suppliers shall not be liable for any indirect, special, incidental, consequential or exemplary damages arising from your use of, inability to use, or reliance upon breathemagazine.com.au. These exclusions apply to any claims for lost profits, lost data, loss of goodwill, work stoppage, computer failure or malfunction, or any other commercial damages or losses, even if we knew or should have known of the possibility of such damages. To the fullest extent permitted by law, our liability for breach of any implied warranties, conditions or undertakings which cannot be excluded is limited to (i) the supply of the product or service again or (ii) the payment of the cost of having the product or service supplied again. If you choose to access breathemagazine.com.au from a location outside Australia you do so on your own initiative and you are responsible for compliance with local laws. Your right to use breathemagazine.com.au automatically terminates if you violate the Terms of Service or any rules or guidelines posted in connection with breathemagazine.com.au. We also reserve the right, in our sole discretion, to terminate your access to all or part of breathemagazine.com.au, for any reason, with or without notice.